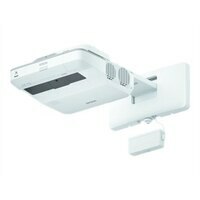 Transform your classroom into a collaborative learning space with the BrightLink 696Ui touch-enabled, Full HD WUXGA ultra short-throw interactive display. Featuring a powerful 3,800 lumens of color and white brightness, the 696Ui delivers dynamic images up to 100-inch - from as close as 10-inch away. Turn almost any wall or existing whiteboard into an interactive workspace with pen- and touch-based interactivity - up to two pens or six users at one time.